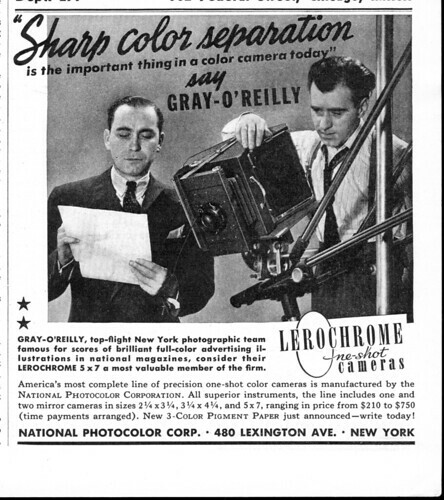 Lerochrome is the name of a range of three-color cameras made by the National Photocolor Corporation of New York in the 1930s and '40s. Cameras were made in three sizes: 2¼x3¼ inch, 3¼x4¼ inch (quarter plate), and 5x7 inch, and could use glass plates, cut film or film packs. They are for a 'one-shot' three-color process; that is, three plates, each exposed through a different colored filter, are exposed simultaneously, and the images combined to make one color image. Thus the cameras have three positions for plate-holders, and internal mirrors to split the image-forming light between them. A 1939 advertisement offers the quarter-plate Lerochrome 'Daylight Special' camera, with an 8¼-inch f/4.5 Meyer Aristostigmat in Compound shutter, and with a coupled rangefinder and parallax-corrected viewfinder. A ground-glass focusing screen can also be used. The dimensions of the camera are 6½x9x9 inches, and its weight 7½ pounds (3 kg). It is metal-bodied, with black crinkle-finish paint and chrome-plated fittings. ↑ Advertisement for Lerochrome cameras by National Photocolor Corp., featuring the quarter-plate 'Daylight Special', in Popular Photography Vol. 5, No. 5 (November 1939), p121; at Google Books. National Photocolor Corporation website; the company makes optical pellicle mirrors and filters. This page was last edited on 29 July 2016, at 18:36.